While this is a sweeping statement, it is certainly true if you are being paid to record drone footage. In the scenario of you making a video for a client, it does not matter how short the aerial part of the video is, you cannot do it without permission from the CAA (Civil Aviation Authority) in the United Kingdom. However, you can use pre-recorded footage, or licensed footage from a stock video website or even footage that your client has previously recorded with their own drone. What you can’t do is be paid to fly your drone without permission from the Civil Aviation Authority. At the time of writing, getting permission involves becoming qualified to fly a drone using a commercial company approved by the CAA and then you would also need to have insurance and pay an annual fee to the CAA of up to £1211. The CAA does not organise or run assessment courses but we approve commercial organisations, known as National Qualified Entities (NQEs) to do this assessment on our behalf. 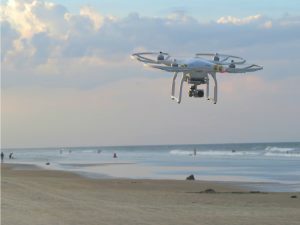 Basically, if you were paying someone to capture aerial footage they would need to be licensed and insured for flying a drone for commercial purposes. Personally, aerial footage is not my primary business and the costs / regulations would make it prohibitively expensive for the small amount of aerial footage I actually include in videos that I am being paid to make. For example, using an opening aerial shot might only be 10 seconds of the entire video, but the regulations mean that I need to be fully certified and compliant whether I record 10 seconds of aerial footage or 40 hours a week. When I looked into this recently, it was going to cost a few thousand pounds here in the UK to get all of this sorted. Also, it is a lot of work and in my opinion completely over the top for what it is. Basically, the qualification takes 5 days and you have to produce detailed operation manuals before you can get insurance and paid for permission from the CAA. I can completely understand that there needs to be some regulation, but we are talking about a device that literally can be flown by a child and has multiple built in safety features. I mean, the DJI drone I fly (as a hobby) will stay in the sky on its own and locks its position with GPS. It will land itself and fly itself back to its take off point when it loses signal or has a low battery. It is pretty hard to crash and very easy to fly. You can even program it to take off and follow a set course before landing. It is a sophisticated piece of technology that can be flown by nearly anyone. So, you or anyone can fly a drone and record footage, but when someone says, come and fly your drone around my property, this is fine unless they offer to pay you. Even if you got paid a small amount, you are now doing something illegal… not because you are flying a drone but because you are flying a drone and getting money for doing it. So, what are the regulations really about? Are they really about your ability to fly the drone and the safety of others? The qualification and associated costs are disproportionate in my opinion. This is a shame, but until the CAA offer more realistic options for part-time aerial footagists, I have to decline that type of work. Some people / companies will offer to do this and turn a blind eye to the regulations, however, this could turn out really bad for you and them and I would not recommend it. You should actually ask about their credentials and insurance cover beforehand. You may say to me, it is just quick aerial shot of my cottage for the end of my video, but while I would love to oblige and certainly can do this (if I was doing your video for free), I simply can’t if you are paying me. Bizarrely, if you got your own drone out and recorded that clip of footage and then sent that to me to include with the non-drone footage I took then that would be ok.
Drones are a contentious issue globally and I am in favour of regulation for the safety of people, but currently I think the aviation authorities are way off the mark. I am a responsible person and would love to include small amounts of aerial footage in my paid work for creative purposes, but I am forced to either not do this (current situation) or do it illegally. Unfortunately, there are less responsible people doing the latter and I think they might not if the training and costs were proportionate. You can argue about the fact that the drone is being flown for monetary purposes, and you could say that this needs regulating. In some respects I agree. For example, if your entire business involves inspecting property and building structures and flying your drone close to these, then insurance and heavy regulation makes sense. However, if you are just hoping to add a few seconds of distant aerial footage to add a creative element to a film, then my view is that the requirements of the CAA are ridiculous, especially as you need no training to do it if you are not being paid. Surely that is analogous to being able to ride a bike for free but then being told you suddenly have to go through in depth training, pay annual insurance and get permission that will total several thousand pounds because you are now delivering newspapers with it. Personally, I would be happy to do the training, pay the insurance etc. if it was proportional to my use, but thousands of pounds is way off the mark. It seems that the CAA are able to find ways to make it difficult for people to earn money with drones, but the biggest problems are caused by irresponsible hobbyists. Perhaps, varying levels of regulation and costs should be brought in that take into account a) how safe the drone is that you own and b) what exactly you are doing with it. Feel free to leave your views and share this piece.